20.07.18 We provide a Conference App. It is still under development. Please be patient with us. 19.07.18 Updated version of the program booklet. 11.07.18 We now provide the Book of Abstracts. You will be handed a hard copy of the book when you come to our registration desk during the conference. A minor update has been made to the preliminary program. The mathematical modeling, simulation and analysis of wave phenomena entail a plethora of fascinating and challenging problems both in analysis and numerical mathematics. 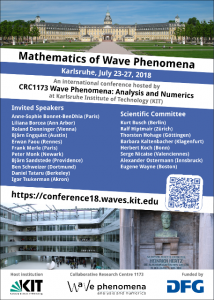 During the past decades, these challenges have inspired a number of important approaches, developments and results about wave-type equations in both fields of mathematics. In this conference we want to bring together international experts with different background to stimulate the transfer of ideas, results, and techniques within this exciting area. The scientific programs further consists of minisymposia and contributed talks. The number of talks is restricted by the local capacities. There is no conference fee. Registration has been closed. Female participants and young researchers are particularly encouraged to present a talk. We have limited resources for travel and/or accommodation support. In case you want to apply for support, please send us a letter of motivation before April 15, 2018 to admin@waves.kit.edu. PhD students should add a confirmation from their advisor. The conference takes place at the Department of Mathematics and a nearby lecture hall on Campus South of KIT in the center of Karlsruhe.